Mere months after settling the suit, the former staffer sued Cinefamily and Belove a second time, alleging the fresh settlement agreement had already been breached. This time, the complaint also alleged the intentional infliction of emotional distress. A knowledgeable insider told CinefamilyAccountability (CA) the second suit stemmed from allegedly derogatory comments Belove made about the ex-staffer to a prospective employer. In early 2016 the second suit was also settled. 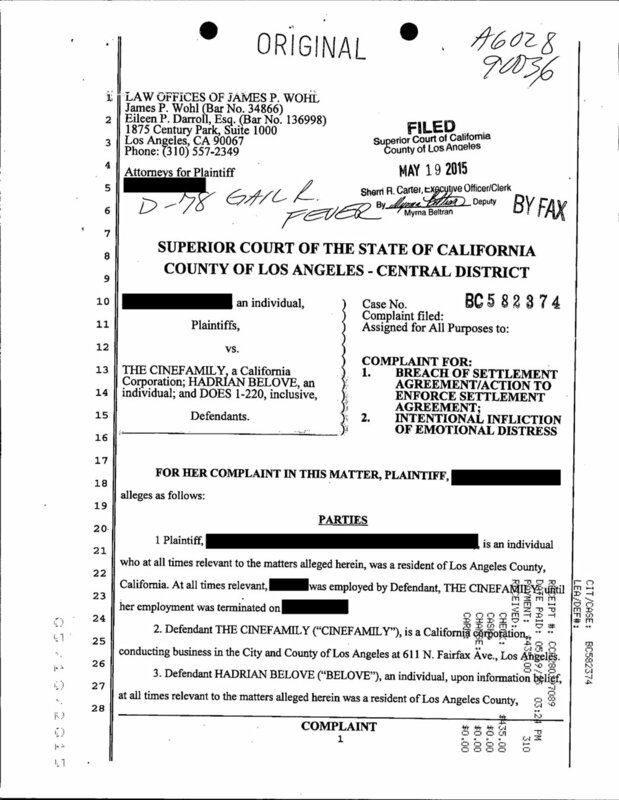 In late 2017, Cinefamily was once more a named defendant as the former staffer filed a third suit over these issues, again alleging violations of the settlement agreement, and attempting to revive charges from the earlier suits. This third lawsuit appears to be winding down. A hearing remains on the books for next month, but the suit seems to have ended in terms mostly favorable to Cinefamily and Belove. It is not clear if or how the end of the sexual harassment lawsuit against Cinefamily affects Fairfax Cinema. Earlier this year, a Cinefamily/Fairfax Cinema staffer claimed the rebranded entity would be open by summer or fall. No one from Cinefamily/Fairfax Cinema has provided an updated timeline. Nor have any of the principals addressed the many Cinefamily problems that continue to dog them.